Today I made a batch of almond milk. First time I’ve done that, and it was really easy! 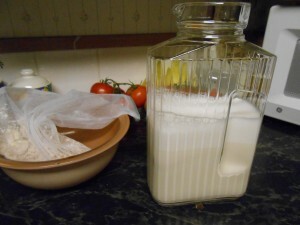 I put the almonds in yesterday to soak, and this morning dumped them into the blender with four cups of water, and a minute later poured it out into one of those fine mesh produce bags (thanks to the Rawtarian for the suggestion!) to strain out the pulp. I’m going to use the pulp later to make cookies! Yum! 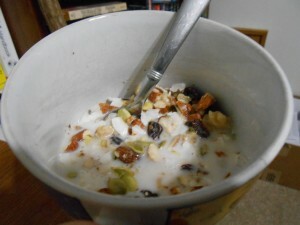 After making the milk I mixed up a bowl of chopped almonds, walnuts, raw pumpkin seeds, coconut flakes and raisins. I poured over some of the almond milk and had a fun crunchy bowl of muesli.